We have spickets in the house. What’s a spicket, you ask? A spicket is a horribly gianormous mutation that obviously occurred during the time a spider was holding a cricket captive and decided the cricket looked, uh, nice that day. It resembles a wolf spider, has two extra long antennae, a lengthy tail, and possesses the ability to jump higher than a cricket. Like straight up. At face-level. Seriously. I have also learned they do so purposely as an intimidation tactic. This bug is actually trying to scare me. It THINKS. It’s the kind of stuff my nightmares are made of. Early this morning, Keith finally got to hear what his girlfriend sounds like when she screams. Loudly. It wasn’t pretty. They’re fast. Like Edward Cullen fast. I assume this is because (yes, I know what assuming does) they realize just how bad they look. I’d be willing to bet these babies would turn to stone just by seeing their reflection in a mirror. I made a new Kill this morning, the second one within 24 hours. This morning’s Kill was about the size of a silver dollar. A bug should not be the size of a silver dollar. It’s just not natural. If you are able to catch up to one, it’s a gross Kill since they’re quite meaty – their upper thighs resemble those of a bodybuilder. Afterwards I went into the bedroom where Keith was sitting straight up in bed. At this point I wouldn’t have been more surprised if his head had spun around in Linda Blair fashion. “We’ve got jumping spiders” I said. “We can’t do this. We just can’t.” (Note the “We”, as in Us, as in No Us if They stay.) Of course I didn’t come right out and say that it was either me or the spickets – I think I made a point without saying anything like that. “I’ll stop on the way home and get some stuff” he said. I locked eyes with him and held the glare for what seemed like 60 seconds but was probably only about 10. I really do think he understood me, he’s just good like that. He also kept any witty comments he might’ve had about my sheet-white face locked up tight in his little bag of tricks. To be pulled out at a more opportune time, I’m sure. Like maybe at the next family reunion. Enter Google. Old faithful, trusty, reliable Google. I heart Google. Results = Camel Cricket or Cave Cricket, they’re one in the same. Oh good! So now I can replace the slang name ‘jumping spiders’ I’ve given them all my life with better terminology. Cave cricket – let’s see, what else lives in a cave? Bats. Spiders. Snakes. Bears. Monsters. The Unknown. Any insect that lives in a cave, well who the heck knows what they do in the dark? I also read they are people-intimidators. YA THINK? 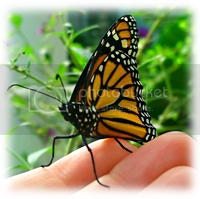 This entry was posted on July 28, 2011 by Bonnie. It was filed under Insects and was tagged with 2011, Bugs, Camel Cricket, Cave Cricket, Fear, Home, Insects, Jumping Spiders, life, Lifestyle, Miscellaneous, Personal, random, Random Thoughts, thoughts. Nice little buggers aren’t they? 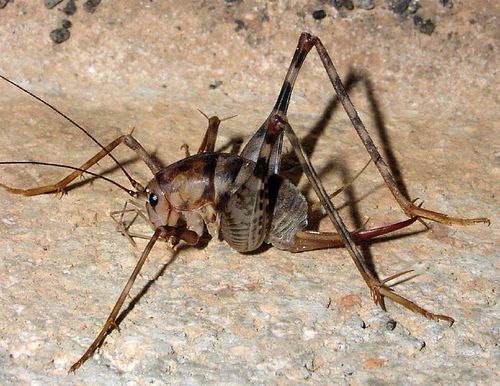 I am DEATHLY afraid of spiders, but believe it or not, Cave Crickets do not scare me!! I’m not saying I LIKE them and I much prefure not seeing them, but I don’t run screaming when I see one. They are weird looking and I think that’s what scares people the most. I grew up in a house that had a full basement and thats where the washer was. In that basement were cave crickets. I HATED going in that basement, but not from any bug. The graveyard was my backyard and when I went to the basement I ALWAYS felt like someone was watching me. I would much rather have a run in with the dreaded cave cricket over the feeling that someone I CAN’t see is watching me! Yeah, the cave cricket wins hands down. This is a true story and Eddie can back me up. One night our neighbors came over to watch a movie. When it came time for them to go, we all went out on the porch. As we stood there I noticed this HUGE spider in the corner. I mean HUGE, since it was the size of a man’s hand! The legs were the size of the fingers on that man’s hands. The next thing I knew, I was on top of the car!! Eddie and Jeff took the rug and hit the monster with it. At that point THOUSANDS of baby spiders began running everywhere!! Some getting into the house! Eddie tells me to go get the bug spray, WTF! I’m NOT getting down from this car for ANY reason! If that HUGE spider had been IN MY HOUSE, I would have dropped dead! No kidding! I hate spiders so much, that before I turn the light out to go to bed, I look all over the room to see if any are lurking around anywhere. If I see one in my house and it gets away…I can forget getting ANY sleep before the sun comes up. One time years ago, I saw a spider in the corner of the living room. I asked Eddie to kill it. Well he thought it was just dirt and THREW IT ON ME!!!!! Like you, I swear my heart stopped! I can tell you one thing…he didn’t get any nookie for awhile. I was sooooo mad at him! When Jason was around 5-6 he walked in the house holding a baby snake. A COPPERHEAD baby snake! His friend had one too! I made them show me where they found them and there was a hole in the grown. I poured gas in it and baby snakes started coming out. I knew momma snake was in there too, so I lit it on fire and ran!! I’m glad Keith was smart enough to understand “WE can’t do this”! haha. Did you check out those THIGHS?! Ugh, yes I did. Kind of reminds me of frog legs. Probably why they can jump so high. And now I hope I don’t dream about them tonight! Horrid! I would not be able to sleep with them creeping around. Yes, they are horrid. Hopefully we are rid of them by now, they were coming from the crawlspace underneath the house. I just googled “terrifying cricket spider thing” after my aptly named cat Peaves spooked one in my basement at me and Google brought me to you. This is probably the best google answer ever. You informed me about what I was being attacked by, entertained me, and commiserated with my fear. 5 golden stars for you! !